NASA's Kepler telescope is still discovering new, distant exoplanets in our corner of the Milky Way, but oftentimes they're hard to visualise and easily forgotten about by some of us normal folk. 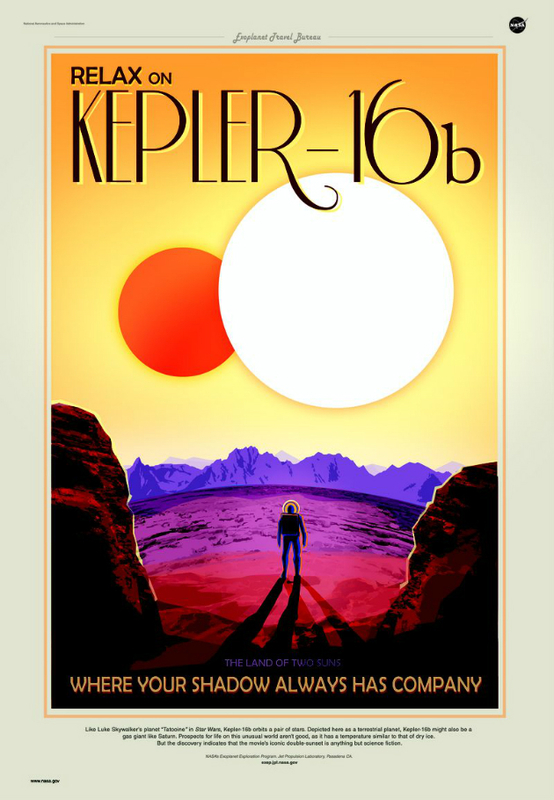 Now, to get everyone dreaming about these potentially habitable worlds, NASA's Jet Propulsion Laboratory has drawn up a trio of beautiful posters by the "Exoplanet Travel Bureau." All three echo the WPA's iconic travel prints from the mid-1930s, with classic typefaces and swathes of flat, contrasting color. Given we don't know exactly what each planet looks like, the designers have taken some creative liberties here -- but they should still be more than enough to spark your own imagination and curiosity in the stars. 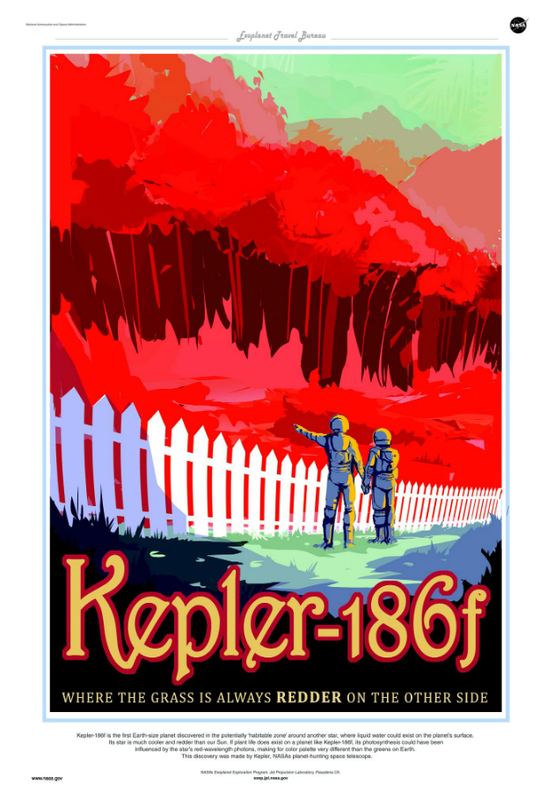 Kepler-186f is one of the most Earth-like planets that NASA's space-venturing telescope has ever identified. First uncovered last April, it sits roughly 500 light years from Earth and is thought to be a rocky planet slightly larger than our own. Here, the artist is playing with the idea that photosynthesis on the surface could be affected by a nearby red dwarf star. 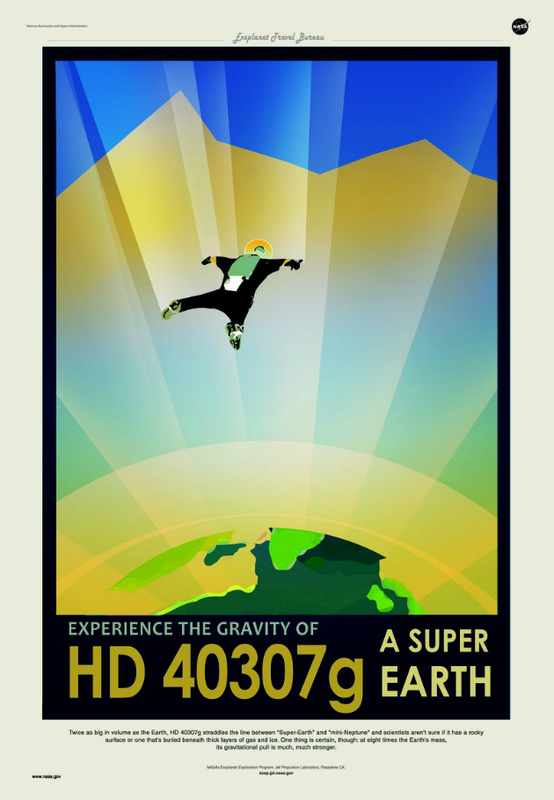 As the poster's design implies, HD 40307g (see, not very memorable) has a strong gravitational pull that far outstrips the one found on Earth. Uncovered by a team of astronomers using the HARPS spectograph at the European Southern Observatory, it's considered a super-Earth and sits 55.8 million miles from its parent star. Two suns, you say? That's right, just like Luke Skywalker's home world of Tatooine, Kepler-16b orbits a pair of giant stars. NASA suspects the planet is a gas giant, so were you to make the trip we wouldn't recommend walking outside and taking in a huge gulp of fresh air.